A bolt of lightning at the finish would be heavy-handed symbolism in a film, but when the 100m final came up it was the way Moscow’s weekend heat wave broke. The lightning started almost half an hour before the 100m was called to the blocks. An earlier wave of rain had stopped as the sprinters lined up, then resumed before Bolt’s introduction, and the showman mimed an umbrella as he was introduced to the crowd. The Jamaican got out of the blocks well and ploughed through the rain in lane six with USA’s Justin Gatlin on his left shoulder. It was clear from halfway that he was already in the lead, and the flash of lightning to the north just after he crossed the line in 9.77 was nothing more than a coincidence, albeit a theatrical one. 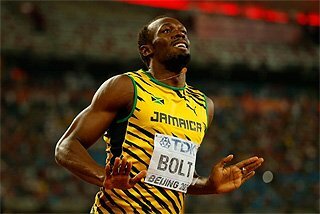 It was not a World record, as his previous championship 100m victory in Berlin was, but it was a race, a story, and a victory, and there are still none quicker than Bolt. Gatlin took silver in 9.85, and Bolt’s countryman Nesta Carter the bronze with 9.95. Bolt was first to the line but not first to reclaim a title, as Tirunesh Dibaba put up her first 10,000m World Championship gold since 2007 in Osaka. 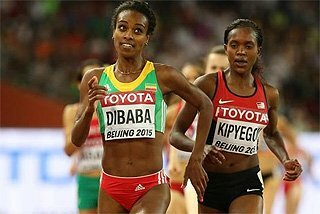 Dibaba won Olympic titles in that time, but this night, six years after Osaka, Dibaba acted out the old script. 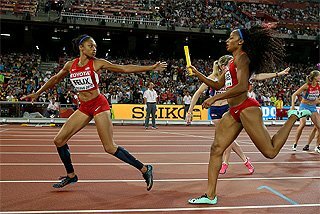 Tucking behind what pacemakers she could find – first Beijing bronze medallist Shalane Flanagan, then Japanese champion Hitomi Niiya – Dibaba stayed out of trouble and in position, then took the lead with 500m to go and steadily wound up to full speed on the backstretch. With Kenya’s Gladys Cherono in pursuit, she arrived at the line in 30:43.45. Cherono took silver in 30:45.17 and Dibaba’s countrywoman Belaynesh Oljira got the best of a close duel with Emily Chebet for bronze, 30:46.98. 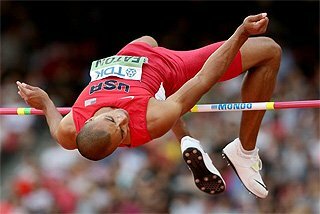 Ashton Eaton became the first combined events athlete to hold a complete set of indoor and outdoor World titles, World records, and the Olympic title when he won his first World Championship today with 8809 points. Eaton’s closest competitor at the start of the day, Gunnar Nixon, slid down the standings as second-day decathletes Michael Schrader of Germany (8670) and, eventually, Canada’s Damian Warner (8512) solidified positions at the top of the table. 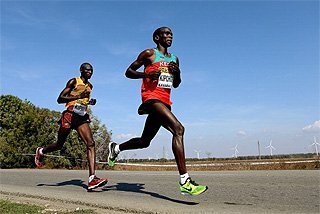 Warner fended off a 1500m challenge from 2010 World junior champion Kevin Mayer, who ended in fourth. Defending Long Jump champion Brittney Reese of the USA squeaked into the final as the last qualifier from the first round on Saturday. 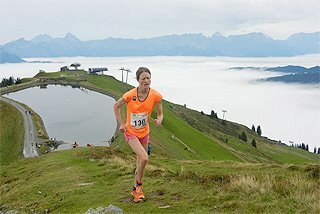 On Sunday she seemed to have fixed whatever plagued her on Saturday as she reached 7.01m in the second round and remained untouched for the remainder of the competition. 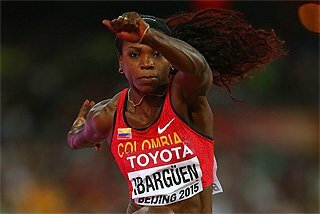 Blessing Okagbare of Nigeria gave that mark a scare with a 6.99m in the fifth round but settled for silver; Ivana Spanovic earned bronze with a fifth-round 6.82m leap, winning Serbia’s first ever World Championships medal. 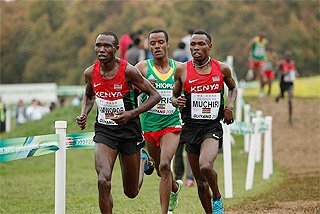 The men’s 20km Race Walk became the first medal and the first gold for the host Russians, as Aleksandr Ivanov covered several early moves and managed to stay out of penalty trouble in the late racing. 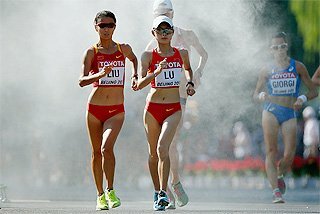 Ivanov was tailed closely by Ding Chen of China, ultimately holding a winning margin of 11 seconds (1:20:58 to 1:21:09) to become the youngest ever winner of the men’s race walking event at the World Championships. Miguel Lopez of Spain took bronze. Sandra Perkovic threw 67.99m in the second round of the Discus to take gold in that event, but all three of her legal throws would have been enough to win as the silver was won by Melina Robert-Michon’s French record of 66.28m. Robert-Michon moved into second in the round two but improved her mark through the subsequent rounds. Yarelys Barrios led the first round with a 64.96m toss, but failed to improve on that as first Perkovic, then Robert-Michon surpassed her. 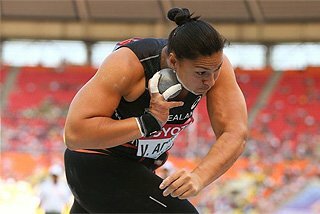 Qualifying and intermediate rounds on Sunday in the women’s Shot Put and Pole Vault, men’s 800m and women’s 100m, 400m and 1500m offered few surprises. 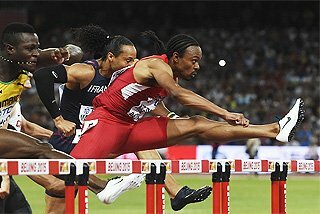 The men’s 110m Hurdles, a less predictable event, will be poorer for the lack of Orlando Ortega and Pascal Martinot-Lagarde, both of whom failed to make it through, having battled with recent injuries. 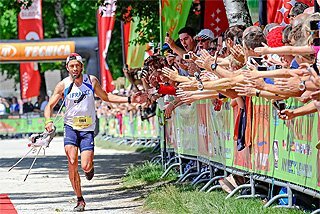 Sat 10 & Sun 11 Aug - 59,000 capacity (43,000 spectators + 16,000 accredited guests - VIPS, media, athletes etc...).